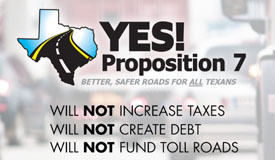 Editorial boards at the state's major newspapers are unanimous in urging Texas voters to approve Propositions 7, the highway funding amendment on the November 3rd constitutional amendment election ballot. In its endorsement the Fort Worth Star-Telegram pointed out that measure taken to fill the state's growing highway funding shortfall are still far short of meeting the $5 billion per year goal determined by the Texas Transportation Institute. "If Texans vote for only one item on the Nov. 3 constitutional amendment ballot, it should be Proposition 7," the editors wrote. The Dallas Morning News made it simple: "Proposition 7 gives Texans an opportunity to start catching up on road projects, which is what we need." The Corpus Christi Caller-Times pointed to a guest column by state Senator Juan "Chuy" Hinojosa who represents much of South Texas and joined him in enthusiastically supporting Proposition 7. "An estimated 1,000 people move to Texas each day. Most don't walk here. We need to maintain and grow our road system if Texas is to keep up. Please vote for Proposition 7." The El Paso Times pointed out that Prop 7 will dedicate $2.5 billion of already collected sales and use tax to the State Highway Fund -- money that currently goes to the General Fund. "Proposition 7 would create much-needed dedicated revenue stream for transportation infrastructure. The El Paso Times urges a “for” vote on Proposition 7." The Houston Chronicle said Proposition 7 is the outgrowth of lawmakers unwilling to raise the gas tax or user fees to pay for the state's transportation needs - "underfunded for several decades," says state Sen. Robert Nichols, R-Jacksonville, who chairs the Senate Transportation Committee. "Although we would prefer lawmakers who are forthright enough to address the issue head-on, this amendment is probably the best we can hope for. As Nichols points out, it gives the Texas Department of Transportation "a predictable revenue source six to eight years out." The Houston area, by the way, will get nearly $204 million a year if Proposition 7 is approved. We recommend a YES vote on Proposition 7." The Austin American-Statesman editors reminded readers that Prop 7 is the sequel to the constitutional amendment known as Proposition 1 that 80% of voters approved last November. "We support Prop 7 for many of the same reasons we supported Proposition 1. Approving Prop 7 will help highway planners by giving them a steady source of revenue and will save and add construction jobs. Good roads are essential to keeping Texas economically competitive and vital. And none of the money collected under Prop. 7 can be used on toll roads." "It’s not as though Texas hasn’t been spending money on roads over the past decade or so. Total Texas spending per capita on highways increased almost 50 percent from 2003 to 2013 — from $388 per Texan to $567, adjusted for inflation. ""But the Texas Department of Transportation borrowed heavily to pay for all that spending — a break from the past when the state paid as it went. The Republican-controlled Legislature and former Gov. Rick Perry, reluctant to raise taxes or fees to keep up with highway demand, allowed TxDOT to put $18 billion of new roads — including tollways — on the state credit card. Payment on that debt is expected to reach $2.4 billion over the current and next fiscal years." "In 2013, TxDOT officials said they needed an additional $5 billion a year just to maintain the state’s 80,000-mile highway system and keep congestion at 2010 levels. Together, Props. 1 and 7 — if Prop. 7 passes — would meet most of that need as the state again pays for roads without borrowing." "A fundamental truth about traffic — which is as certain in life as death and taxes — is that it only gets worse as the population inevitably increases. Roads must be built, and the ones that are built must be maintained — and roads are not cheap to build or maintain. Dedicated, reliable sources of revenue for roads are needed." "Voters last year approved a constitutional change that took energy production taxes that otherwise would have gone to the state’s rainy day fund to help replenish the depleted state highway fund. Proposition 7 would further that commitment to better fund roads. "Other approaches haven’t gotten the job done. The gasoline tax, our largest revenue source for highway construction and road maintenance, has remained unchanged for more than two decades. Adjusted for inflation, the 20-cent-per-gallon tax, approved in 1991, is worth a mere 9.2 cents per gallon today. "Texas has turned to bonds and tolled road to fund projects, but those approaches have run their course, too. For example, payments on debt for transportation now are greater than expenditures for new construction. "Proposition 7 provides safeguards in case of slower economic times. With two-thirds votes in the House and Senate, lawmakers could reduce the dispersal up to 50 percent for the next budget cycle to address other critical needs. "The measure also would add financial certainty for planning expensive road projects, which require years of lead time. And while reducing the need for tolled roads, it also would prohibit its dedicated funds from going to such roads."